Eating out at restaurants is a luxury most of us indulge in quite often. My family usually eats out at least once a week. Sadly, we don’t always eat out because we want to eat out. Many times we find ourselves eating out because we forgot to take out something to prepare for dinner. We aren’t alone. It’s easy to see why dining out can start to take over a large portion of your budget without you realizing it. Luckily, there are quite a few ways you can reduce the amount of money you spend eating out. If you’re looking to trim your eating out budget, try some of the following ideas and let us know how they work out. While limiting how often you eat out may not be fun, it is by far the most effective way to cut down on your eating out expenditures. Here are a few ways you can limit your spending. The way to save the most money is quit eating out altogether. While never eating out may be possible, it takes a lot of will power and planning to enact. Even if you make rare exceptions for vacations or other special events, you’ll still likely save a lot of money by quitting dining out on a regular basis. Eating out less is much easier than quitting eating out cold turkey. Challenge yourself to only eat out half as much as you usually do. Another option is to limit your dining out to a specific number of times per week or month. One of the quickest ways eating out can get out of hand is eating out for lunch at work. If you can’t stand your job or your coworkers, you may look to lunch as an escape from the office. Rather than spend money on your escape, pack a lunch and head to a local park to eat. Eating out seems to become a replacement for when we just don’t feel like cooking. Instead of dining out because you don’t want to cook, only eat out when it is a special occasion. Go out for birthdays, anniversaries, vacations and celebrations. It will make eating out much more special and save you a good chunk of change at the same time. One easy way to reduce your dining out bill is reducing the number of times you eat out because you forgot to set something out for dinner. Here are a couple easy ways to accomplish that task. Meal planning is a great way to avoid dining out. You can meal plan one week or one month at a time. Make sure you have enough food to cook each meal in advance and you’ll be set. Check your meal plan list on a regular basis to make sure you thaw out whatever frozen meat you may need in advance of meal preparation. Even if you meal plan, you might make a mistake and end up without a dinner every so often. Solve this by having a back up plan. Freezer meals are a great back up plan. Simply freeze individual portions of a meal and thaw them out whenever you realize you don’t have something for dinner. Keep track of how many freezer meals you have available to make sure you never run out. Not everyone wants to cut back on how often they dine out. Even if you budget a significant amount of money to eat out a regular basis, you can still save by being smart when you do eat out. Cash back or rewards credit cards can save you anywhere from 1 to 5 percent on your next meal out. While you won’t get the discount directly on your bill, you can usually redeem points for a statement credit or cash back depending on the credit card. Just make sure you never charge more than you can pay off in full each month. If you can’t control your spending with credit cards, skip this tip even though it may be tempting to save a couple percent. You’ll pay much more in interest than you’ll earn in rewards. If you want to save 15 to 20 percent on your next trip to a restaurant, skip sit down restaurants that have servers. If you don’t have a server, you don’t have to tip. You can even carry out from many chain restaurants to avoid tipping. While some people argue you should tip on carry out meals, I think that’s outrageous. It is your choice, though. Skipping drinks, whether you drink soda or alcoholic beverages, can save a decent amount on your next restaurant bill. Two drinks usually add at least five dollars for non-alcoholic beverages and at least 10 bucks for the cheapest alcoholic beverages. If you like to have multiple drinks or have kids, you could easily spend a fortune on drinks. Skip the drinks and order tap water with your meal. If you really want an alcoholic beverage or a soda, grab one when you get home for a much lower price. If you absolutely must have alcoholic beverages with your meal, make sure you go out to eat during happy hour when drinks are often on sale. Yes, you’ll still be paying much more than you would to make the same drink at home, but at least you won’t pay full price. I don’t know about you, but I don’t eat an appetizer and/or dessert every night at home. So, when you go out to eat at a restaurant, why would you? Personally, we almost never order appetizers or desserts at restaurants unless we have a coupon that covers the cost in full. If you’re looking to save some money on your dining out budget, I highly recommend you do the same. You might have realized many restaurants have a cheaper lunch menu and a more expensive dinner menu. When you’re home for the day, consider eating out for lunch rather than for dinner. Then, have a simple dinner at home. 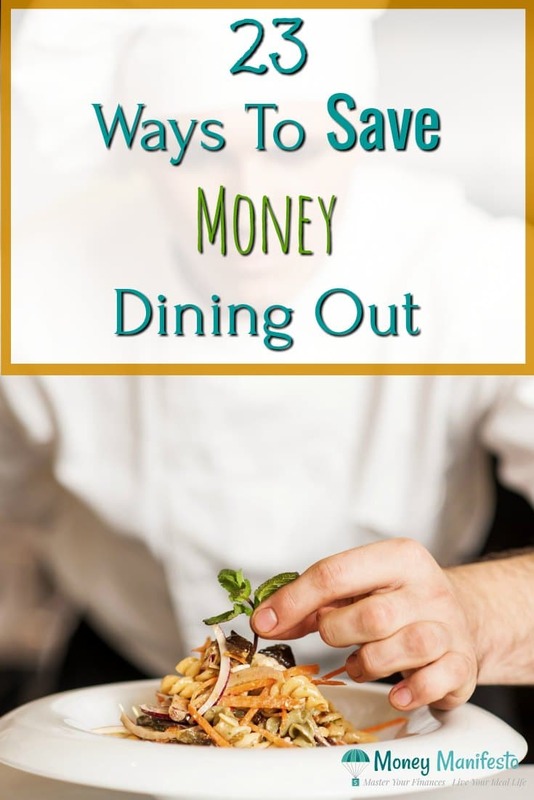 This is a great way to save a few bucks on your dining out costs. If you’re over 50 or are a military veteran, it never hurts to ask restaurants if they offer senior or military discounts before paying your bill. The age for senior discounts varies by restaurant, so make sure to ask. Don’t be bashful. Take the discount. You earned it. Many restaurants offer kids eat free with purchase of an adult entree. Take advantage of the truly free kids eat free deals to save on your bill. However, make sure to watch out for kids eat free deals that require you to buy items you otherwise wouldn’t as it could be more expensive than paying for the kids meal outright. Portions in American restaurants are mostly insane. If you want to save money, split a meal with your spouse or split the meal and take the other half home for a second meal. Either way, you save money and get two meals for the price of one. Because so many regular meals are huge, you could easily get away with ordering an appetizer as an entree in many restaurants and still be full. Appetizers are usually cheaper than entrees, so save some money and calories by getting an appetizer instead. Another great way to save is finding deals before you head out to eat. You need to be careful that you don’t allow deals to cause you to eat out more than normal. In addition to the tips to find deals below, I’ll share how to avoid eating out more because of the tip. You can often find deals and specials on social media. Follow restaurants pages on Facebook and feeds on Twitter. When you’re about to head out to eat, check and see which restaurants are offering deals on their pages. Whatever you do, don’t go looking at these pages and feeds when you aren’t planning to go out. Even if there is an amazing deal, you’ll still spend money you didn’t plan on spending if you buy the deal. Loyalty rewards are a great way to save. Depending on the chain, you can earn free items or discounts after purchasing a certain number of items or a certain dollar amount. Just make sure you’re not spending money only to receive the reward. If you are, you’ve fallen into the trap. Many restaurants offer you something for free on your birthday. Others send you coupons through email for birthday meals or treats. While some restaurants require you to actually visit on your birthday, others allow you to use the deal within a couple weeks of your birthday or during your birthday month. Don’t spend more than usual trying to use as many deals as possible. Instead, pick your favorites while keeping within your budget. If you aren’t picky about when you eat, early bird specials can save you a good chunk of change. Simply dine during the early bird specials to save. Just make sure you have a plan in case you get hungry later that night because you ate early. Discounted gift cards are another great way to save. Personally, we buy discounted gift cards from Sam’s Club because we know they’re real. That said, there are plenty of legitimate gift card resellers online. When you’re using discounted gift cards, make sure you don’t purchase something more expensive than usual because you know you’re getting a discount. Otherwise, you’ll spend just as much as or more than you would have in the first place. Coupons are always a great way to save on dining out. While coupons can commonly be found in newspaper inserts and in your inbox, you may have to sign up for restaurant mailing lists to get other coupons in your mailbox. Don’t let coupons tempt you to eat out when you weren’t planning on it. If you do, the marketers will have won. Personally, we keep all restaurant coupons in a drawer then go look in the drawer when we decide to go out to see what options we have. If you’ve ever bought a discount card or coupon book, you know they can be a double edged sword. The books are generally sold as fundraising items, so you buy them without much thought to support whoever is selling them. Instead of blindly buying discount cards or coupon books, look through them to make sure you’ll save more money than the purchase price of the card or book. Only consider coupons and discounts you know you’ll use. If the total savings comes out to be a significant amount more than the cost of the book or card, go ahead and get it. Otherwise, skip on the purchase. If you really want to support the cause, donate cash so the cause will receive all of the proceeds rather than just a portion. If your goal is to start spending less money eating out, you should start today. Don’t put it off. You should easily be able to find at least a few ways to save from the list above. Afterward, you can take the money you save and put it toward more important financial goals. What’s your favorite way to save money eating out?